In the Search Windows text box, next to the Start button on the taskbar, type sysdm.cpl and press Enter. 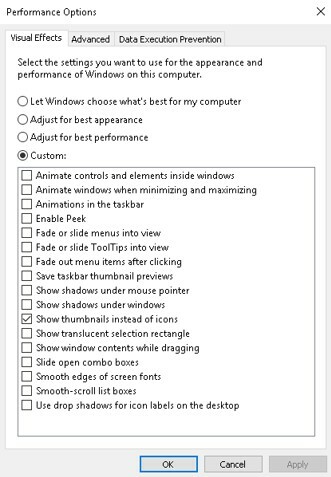 In the Performance Options window, select the Adjust for best performance option, then click the OK button. Tip: If you have picture files and like to see a thumbnail of that picture as the icon for the file, check the box for the Show thumbnails instead of icons option. Doing so will result in the Custom option being selected instead of the Adjust for best performance option, which is okay. Open the Search Windows text box, next to the Start button on the taskbar, type system maintenance, then press Enter.